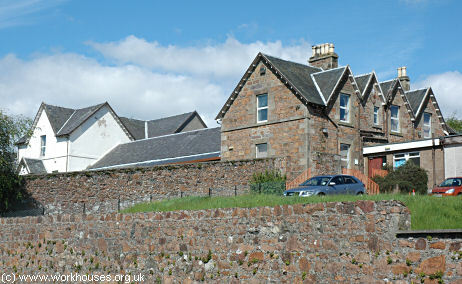 Campbeltown Poorhouse was erected in 1859-61 on what is now Witchburn Road to the west of Campbeltown. Robert Matheson was originally appointed architect but withdrew after a dispute over the cost of the project and was reaplced by John Honeyman. The original building had a central two-storey section with single-storey wings to each side. A fever block was added in 1866. This was perhaps the small U-shaped block at the rear, with what may be a separate isolation block to its north. By 1899, the main building had been extended by the addition of two-storey cross-wings at each side. The infirmary(?) block was extended to the west. Witchburn Cottage Hospital was erected on an adjacent site to the west of the poorhouse. Campbeltown poorhouse from the south-east, 2006. 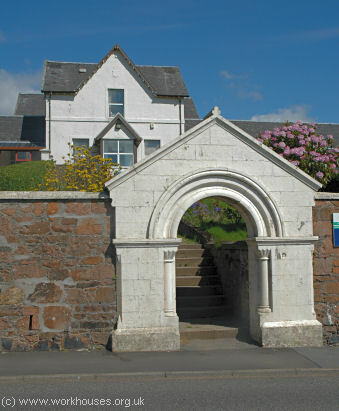 Campbeltown poorhouse entrance from the south, 2006. Campbeltown poorhouse eastern wing the south-east, 2006. 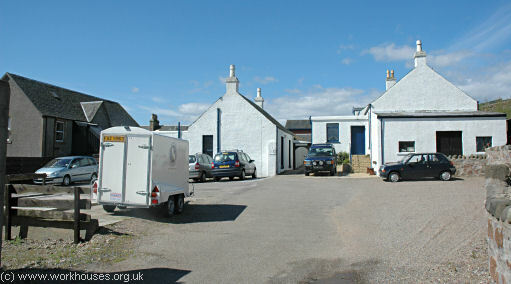 Campbeltown outbuildings and infirmary from the east, 2006. After 1930, the poorhouse became Witchburn House Poor Law Institution. By the 1940s, one wing on the ground floor had been taken over as offices by the County Treasurer. During the Second World War, the other wing was annexed by the cottage hospital and contained 30 EMS beds. The former poorhouse buildings are now used as local council offices. Argyll and Bute Council Archives, Manse Brae, Lochgilphead PA31 8QU, Scotland. Holdings: Poorhouse Committee minute books (1855-61, 1888-1930); Register of inmates (1922-68); Architectural drawings (1859-1911).